Today we’re featuring an article by my dear friend, Mary Ellen, aka “Angel Scribe.” She’s a talented writer and widely published in several different areas, including angels. the Angels descend to earth. They left feathers at people’s feet. ….for us to see they had indeed passed this way. Angels must have sacks full of it to work with questioning skeptics. then neglect the presents left at their very feet. and call it a coincidence? and in good/God working order. Let someone else be the skeptic whose mind neutralizes the miracles. It is your job to believe. Believe in them enough to know they will manifest in any way they can. 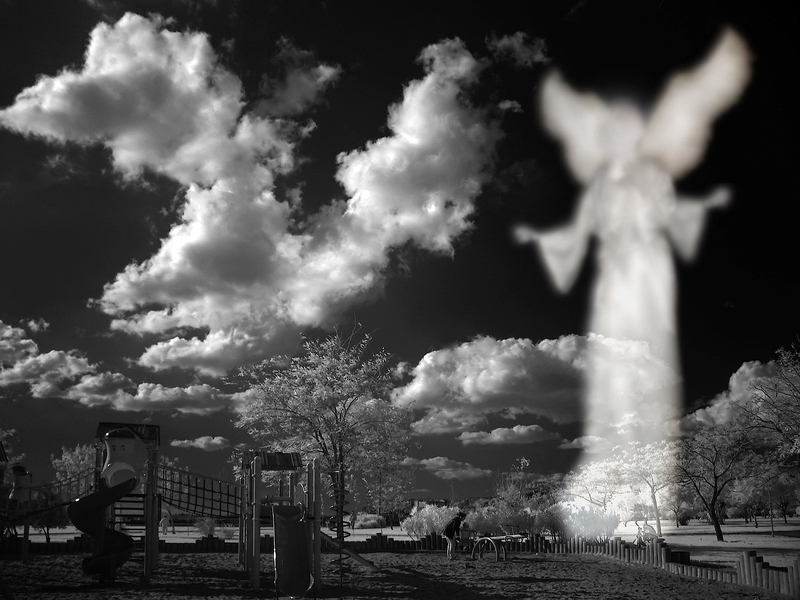 In this video, Do Guardian Angels Exist? ABC News interviews John Geiger, author of the book, The Third Man Factor. The interview probably raises more questions than it answers. What is your experience with angels? Please share your thoughts and comments with us below. This is all well explained in the trilogy ” My Big Toe ” by Tom Campbell from the perspective of a scientist. He tries to keep it simple but I still will reread it a second time. What I found most interesting is that the material is in total agreement with the the law of attraction material as taught by Jerry and Esther Hicks but simply uses different words or images. Thanks very much, Ron, for the information. I had just come back from the airport. My sister was returning to Mexico where she lived. She had been diagnosed with pancreatic cancer and given a few months to live. I didn’t know if I would see her again. I was distraught and needed to weep. I went to my local park where I knew I could be private. After a good cry I felt the need to walk. Everything looked grey bit there on the path was a rose petal…and then another…and anothet. They were all different colours and they increased in number as I waljed. A trail of colour in the greyness culminating in a heart shape made up of red petals and, in petals, a lover’s declaration. I forget the names that were written now. This romantic gesture had brought colour back to my world. I figured a lover had maybe done that as a way of proposing. I recall thinking how potent that experience was for me. It lifted me up. I think we can all be angels to each other with the smallest touch….just a smile can do it sometimes. I was reminded of this with the idea of angels leaving coins for us to find as reminders. Thank you. I loved learning about the angels in this post and the video particularly enlightening. Thanks very much, Margaret, for sharing this beautifully touching story. Indeed, we can all be angels to one another. There was a popular song many years ago titled, as I recall, Earth Angel. That truly is what we can be for one another if we simply open our hearts. I absolutely agree that Angels exist although they don’t always take on a particular form. Sometimes the Angels even appear to be you and me! God’s Love is evident everywhere — it just takes awareness and willingness to see it. Thanks for this post. We truly are all angels, at least at one time or another in our earth lives. As you said, all it takes is awareness and the willingness to see God in everyone and everything.